I'm a middle school science teacher (8th grade) at Canyon Middle School in Castro Valley, California. I've had my own personal aquaponics system for about 5 years and I think it's a great teaching tool. I've started putting together an aquaponics system for my classroom. A neighbor donated an IBC tank, which I promptly cut up and took into my classroom. Yay for super wide classroom doors. Last year I had a Kind K5-XL750 grow-light donated to my classroom, so I'm good on the lighting front. 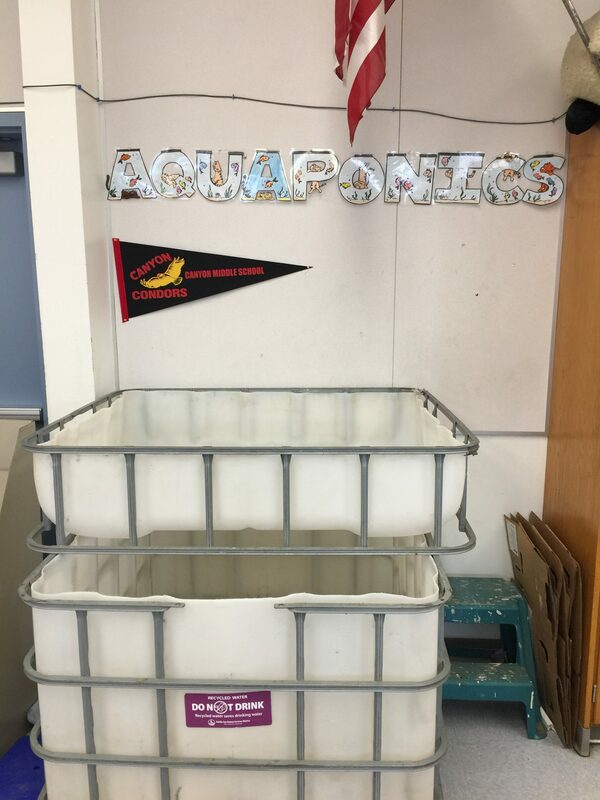 One of the owners of a local hydroponics/aquaponics store (The Lucky Garden in Dublin, CA) is an alumnus of my middle school, so he'll help out with Hydroton, pump, and fish. What else do I need to start out? I'm putting together a DonorsChoose campaign to take advantage of a Sonic campaign called "Limeades for Learning" https://www.limeadesforlearning.com/faq . I'm putting together a <$400 amazon shopping list. I'd appreciate any suggestions for items I should add or remove from my list. The "splurge" item was the Matala aeration system. It's powerful 1.1cfm linear pump, fairly quiet (important for the classroom) and reliable. I'm going over to the school this afternoon to get some work done. Back to school night is on the 13th (this Wednesday) and I want there to be fish and hydroton. The IBC i got was missing the top bars, so I have to build some sort of platform for the grow bed to sit on. I've seen a few examples where 1"x1" square tubing is used to support the weight. That seems to work well, but I don't have any source of inexpensive metal. And Home Depot only sells metal in 3' and 6' lengths, not the 4' or 8' that would work well for an IBC. I'm thinking of bolting 3/4" BCX plywood to the bottom of the grow bed cage. And then building up wood strips to support the recessed area of the top. Do I also need some 2x2 or 2x4 supports to strengthen the plywood? Yes. you could put some 2x4s (or 2x6s) thru the cage at the bottom and skip the plywood. Be sure they extend at least 2" beyond the ends so if/when the bow they don't fall out. Maybe use some screws to keep them from moving lengthwise. Things are progressing along. The tank has water in it, the heater is hooked up, and the cannister filter is getting cycled. I had some used hydroton donated, so I'm in the process of washing it and putting it in the bed.